WEST VILLAGE — Boots & Saddle is closing after being priced out of its longtime home on Christopher Street. The gay bar — known for its drag shows, packed parties and welcoming vibe — cannot afford to pay a rent increase on its space at 76 Christopher St. and will shut down soon after 40 years in the Village, managing owner Rob Ziegler said. "I'm sad," said Ziegler, who started as a bartender at Boots & Saddle in 1999 and later became an owner. "I've been here 15 years. Fifteen years is a long time." Ziegler said a new landlord is taking over the building in the coming months and plans to raise rent for the 700-square-foot bar by thousands of dollars per month, to the "high twenties." According to city records, the building has been owned for decades by Norton Nesis. Nesis declined to say who is buying the building. Ziegler and Boots & Saddle founder Ron Silver are actively looking for a new home, hopefully one that has more space to accommodate the crowds that continue to flock to the bar four decades after Silver opened it. "On the weekends, it gets so packed in here, you actually have to turn people away," bartender Danny Garcia said. "It's ridiculous, it's bad for business." The owners of Boots & Saddle also hope to find a spot that will allow them to serve food, similar to the dinner-club-style drag bar Lips. But in the meantime, regulars are mourning the loss of what they say is a neighborhood institution. "It's always been part of the Christopher Street community, which is being split apart by high rents," said Sandy Kaufman, who has been coming to the bar for more than two decades. Silver opened the bar in 1974 with the owner of Ty's, a gay bar down the street, even though he was warned it was a tough business. "[People] said, 'This won't last more than two years,'" Silver's wife Jerri recalled. "People would say, 'The gay community is fickle.'" But Boots & Saddle has thrived, which the Silvers credited to their policy of accepting everyone who walks in the door. "We treat everybody equally — we feel strongly about that," Jerri Silver added. "If you're kind to people, and you treat them with love and respect, they will keep coming back." Regulars told stories about Silver's kindness during the AIDS epidemic, and Ziegler's reputation for keeping an eye on the neighborhood's streets late at night. 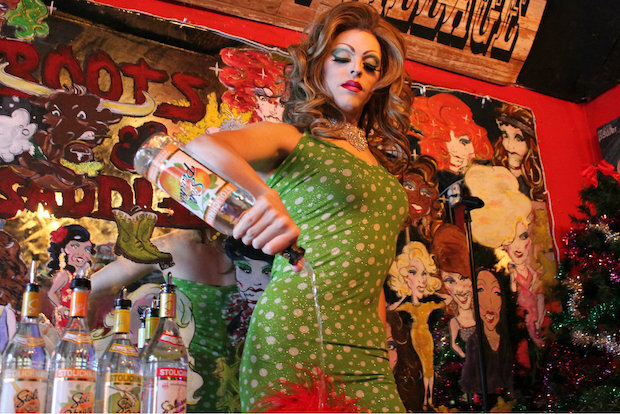 The bar started hosting drag shows about seven years ago, as the owners phased out the go-go boys who used to perform. The drag shows are now daily, and there is twice-weekly karaoke as well. The owners have not set a final closing date, but they have already been searching for a new spot for months. One potential space, at 37 Barrow St., fell through after Community Board 2 denied Boots & Saddle's liquor license application in May, concerned about noise and traffic, according to Ziegler and CB2 records.